Encoded in each stroke of the key, each piece of online dialog, is the DNA make up of how a person thinks or feels-- insight about their behaviors and actions that can’t be discovered without the right technology. Text analytics is the resource growing in popularity that is uncovering the hidden meaning behind online text, and social listening tools are using text analysis to make sense of the online conversation and turn it into actionable insight. So, how does text analytics work? What enables it to learn and understand so much about consumer behavior? And how can we use platforms like social listening tools to measure the data that text analysis can find? Let’s take a look at how text analytics and social listening are working together to bring researchers and brands entirely new insights that the once never dreamed possible. Text analytics is the process of analyzing and deriving meaningful data and insight from text - structured or unstructured. In the case of social listening, that text can be anything where someone creates content on the web: a blog, a social post, an online review, a comment or a forum post, for example. As far as TA in social listening, it goes through a complex process at record speeds to deliver analysis of this text. It has to sift through all the HTML and textual content to understand the entire document, format and parse it into parts to understand in order to analyze. A TA platform is able to analyze that text, identify language cues, categorize it and visualize it for the researcher. By utilizing a.i. Powered natural language understanding, text analysis technology can not only read the text, it can understand it. This makes it a valuable research tool for businesses and brands who are looking to better understand whatever insights they seek. Text analysis works differently for each company, depending on who designs and builds it. The most performant businesses are able to not only understand what each sentence is saying, but also understand the words being used relative to each other. In each case, the word “cell” has different meaning based on the words around it. Text analysis should pick up on these language cues and understand what is being said based on the appropriate context. In the sentence, “I’m mad excited, I just bought a new cell phone!”, the word “cell” in this instance relates to a mobile phone. The other statements clearly are not about cell phones. It is also worth noting that in that statement, we know this person is excited. The use of the word “mad” is slang. With the best text analytics tools, the term “mad excited” will be understood as a positive statement by the platform and will show up as such in a sentiment analysis. What else do we know from the statement? We know they just made a purchase of a cell phone. Text analysis will be able to categorize this statement under the theme of “acquisition” inside a social listening tool. In analyzing just one sentence written online, we can learn so much about person’s experiences thanks to the use of text analytics. 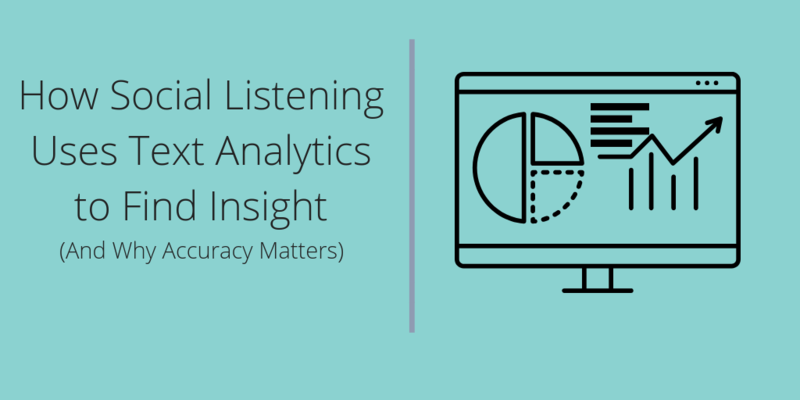 Let’s look at how social listening uses text analysis and the business case for leveraging them both. Social listening is the process of monitoring, tracking and analyzing online dialog and measuring and documenting key metrics within an intuitive dashboard. 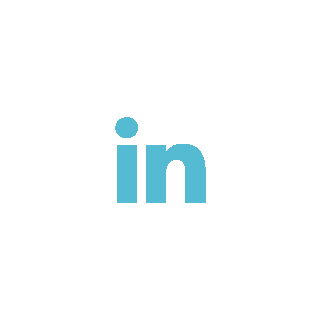 These measurements allow for sentiment analysis, linguistics analysis and topic clouds, demographics, themes, emotions, audience interests, competitive analysis, influencers and more. Text analysis plays a key role in helping social listening work its magic. Social listening implements text analytics technology to process and analyze any number of online text documents. 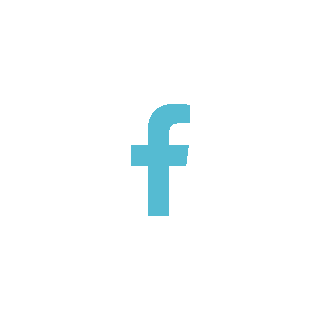 In addition to social posts, forums and emails, you can also use this to analyze online reviews, call center agent notes, survey results, and other types of written text. By parsing out those three categories-- concepts, sentiment and behaviors-- within the online dialog, listening tools help researchers find important, often-missed insights they wouldn’t be able to get elsewhere. Text analysis is able to uncover key themes and patterns in language and deliver them to the researcher - ranging from large trends to small but significant feedback, then deliver that information directly into a social listening interface. Brand Marketers - These teams can discover what consumers think of products, develop audience segmentations and buyer personas, and get competitive intel. In our social listening report on the wearable tech industry, we found some surprising insights about audience segments and consumers’ favorite features and devices. For example, did you know that one of the fastest growing age segments for smartwatches is 55+? Agency Teams- From analysts to strategists to social teams, agencies use listening to measure campaign performance, monitor and track industry trends and audience feedback, and improve their overall ad strategies for clients. In our social listening report for ad agencies and top client brands, we analyzed ad firm Starcom’s campaign for Airbnb targeting business travelers. We found that it had a 74% positive reaction in sentiment analysis and that it aligned with the brand’s core audience interest in business according to our social listening data. Research Teams- Research teams can actually get into the minds of consumers to understand industries and important market trends. Our social listening analysis of Nike target audiences shows that the athletic wear brand’s campaign with Colin Kaepernick resonated strongly with the most important and valuable consumers: their fans, customers and advocates. You can see how various companies and teams have experienced awesome success using social listening in this article. A great trick for those using social listening tools to research their audiences is to find important hidden details you might have missed that may have a significant impact on your brand. The thing is, when you look at data and charts, it’s not always the tallest bar or highest data point that needs to be considered. There are insights everywhere, even where you least expect them. A great example is when we analyzed Amazon reviews for smartwatches and fitness trackers in our Social Insights Report for Wearable Tech. 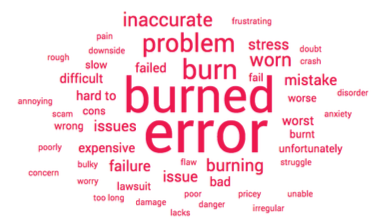 We saw that the term “burn” was showing up as a trending phrase when we dug into the negative phrases online. This hidden trend had a significant impact. As it turns out, that was a trending term-- however small of a trend it may have been-- because people were discussing how their device was literally burning them. This article about how customers were having this heated experience with their wearable tech devices shows that there was a reason why that was showing up in the topic cloud. This is an example of a small trend that has a big impact, underscoring the need for brands and businesses to go through the social listening data on online conversations with a fine-tooth comb. This sounds like a magic pill for your research team. But isn’t always that simple. You don’t just want a tool with shiny bells and whistles. In order to get the right insights, you first need an accurate platform. Not all computers are perfect either. As it turns out, machines can make errors and they can also provide less than accurate results. In order to get the right text analysis data, you need a platform that puts accuracy first. The best social listening tools are able to accurately analyze text and deliver more precise measurements based on that analysis. Take our examples from earlier about the word “cell”. But, it would hurt the results if the search system marks an online statement about a plant cell as being relevant (and the “terrorist cell” will surely come back as a negative sentiment result). These topics that aren’t related to cell phones are not what LG wants, but some social intelligence systems that aren’t all-in on accuracy could make that mistake. Social listening tools with advanced text analytics capabilities are able to fully understand how humans naturally interact, meaning that the tool can accurately read what the actual semantics and meaning behind the online dialog is. It is important to understand groups of words and their contextual meaning. Each word has meaning relative to the words around it using statistical and probabilistic models that can learn any language in the world. If you are going to be making business decisions or recommending business decisions based off data, accuracy is key. Any brand, marketing or research team should be implementing text analysis and social listening to help them make business decisions, optimize their strategy, and understand consumers and customers. There is simply too much online dialog, too many conversations about relevant information, for your team to ignore. Your research and analysis cannot achieve its ultimate goal if the data isn’t representative of the true population. Your text analysis tool should be able to comprehend the concept and meaning behind a phrase. And your social listening tool should be able to aggregate that into reliable data visualizations that help your team succeed. If you’re looking for a set of tools that can meet this high standard, check out Infegy Atlas. Get a free, personalized demo by clicking here.